While you may feel apprehensive toward your little boy's demand for neon walls, superhero bedding, and a floor full of toys, you don’t have to reject a kid-inspired vibe altogether. 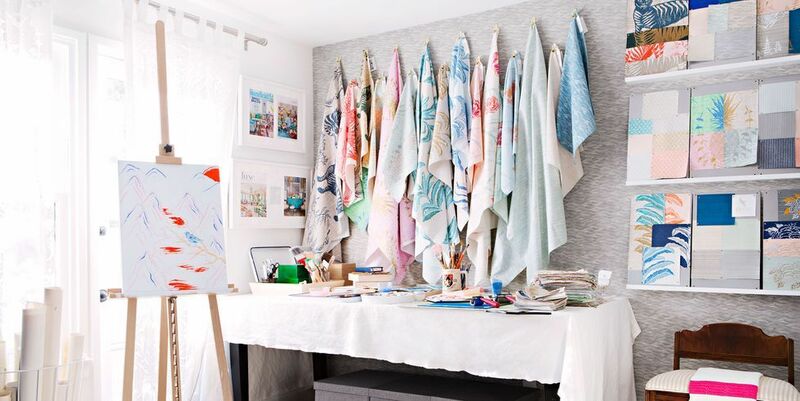 Designing a kids' room that is equal parts youthful and chic is more attainable than it seems. 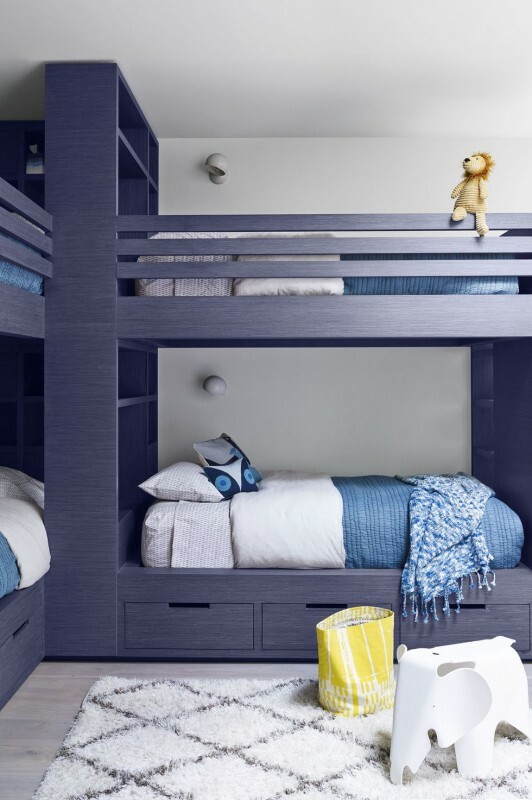 For inspiration, see 20 of our favorite bedroom designs for boys. 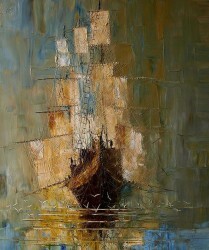 Choosing a nautical theme for a boys' room is an easy way to create a fun, adventurous space in a chic manner. 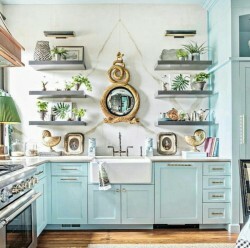 The bright blues of the bed frame, windows, and accents are young and exciting, but can also be reworked into an adult space over time. 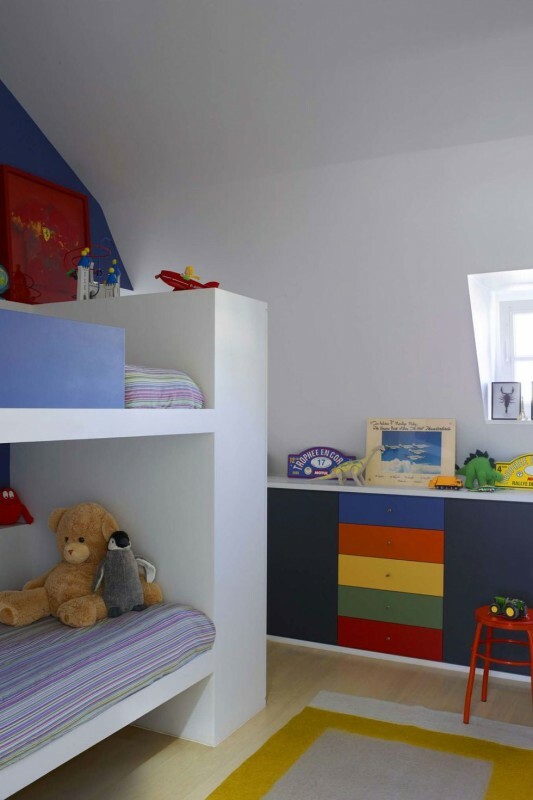 The navy striped wall energizes this boy's room but can be repurposed in a more refined way. The wall art and tiger rug are movable accents that add a youngness without feeling tacky. 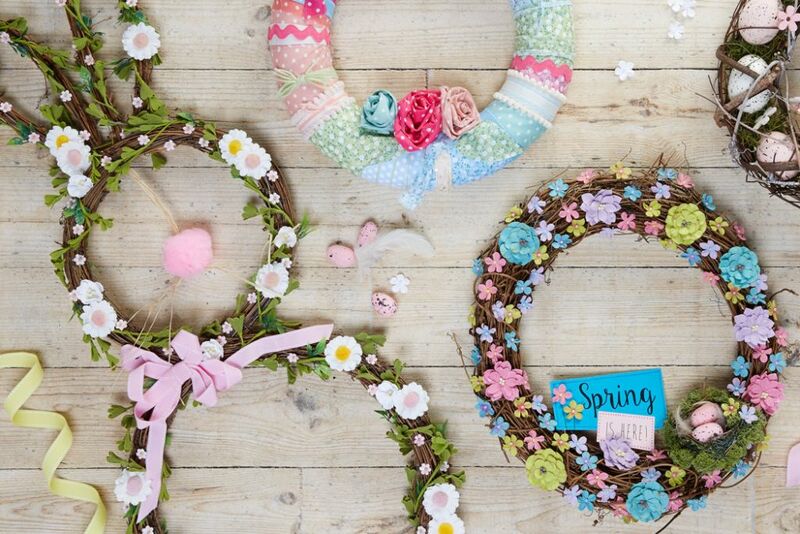 For an easy transition from childhood into teen years and adult life, consider decorative elements that are equally youthful and mature. 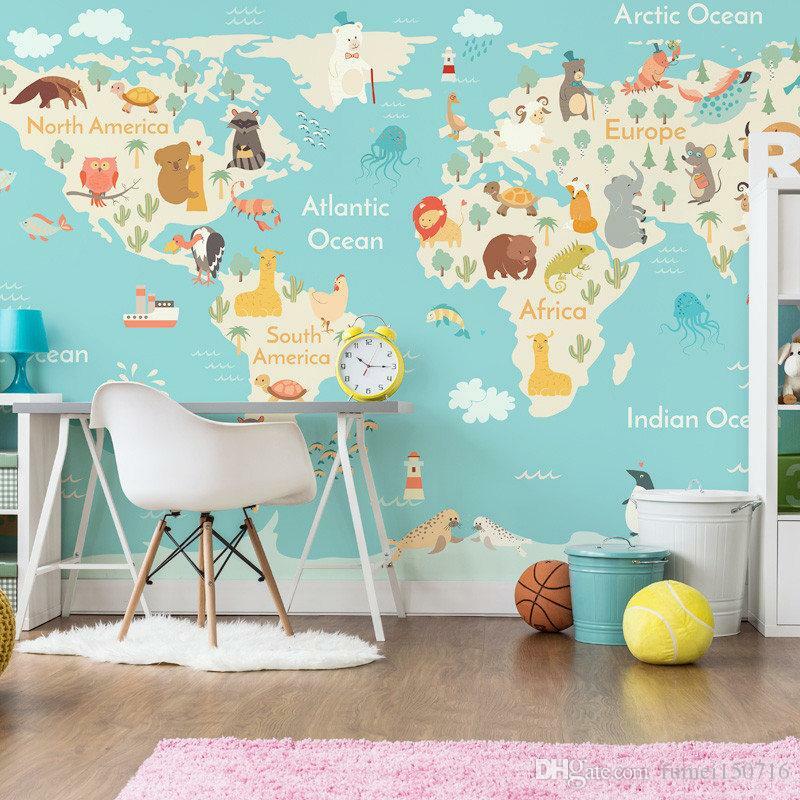 A map on the wall can be an interactive piece for a young child, while its unique coloring makes it a perfect accent for an adult. 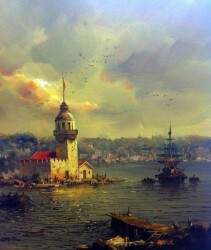 The complementary scattered blues are energetic, and still lend a tranquil vibe. It can be difficult to find ways to keep toys out in the open without cluttering the room. 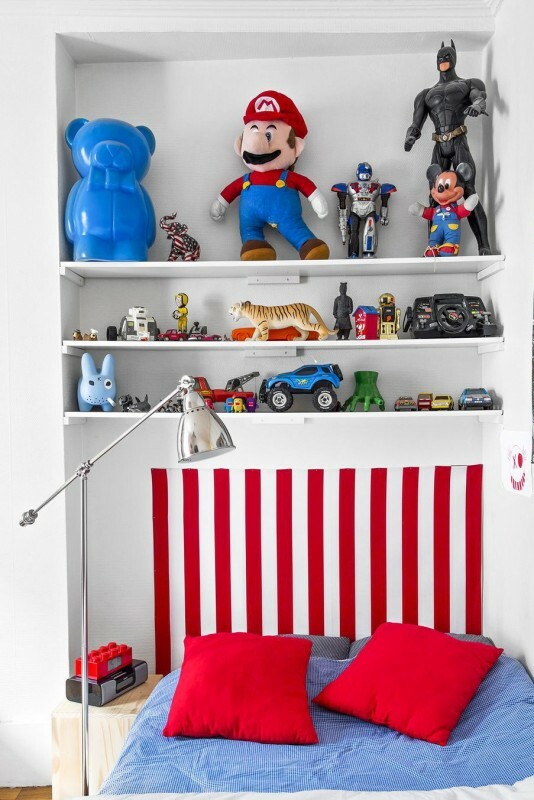 In this Paris apartment, French designer Alix Thomsen neatly arranges her child's vintage and contemporary toys on shelves above the bed, making them an accent as opposed to an eyesore. 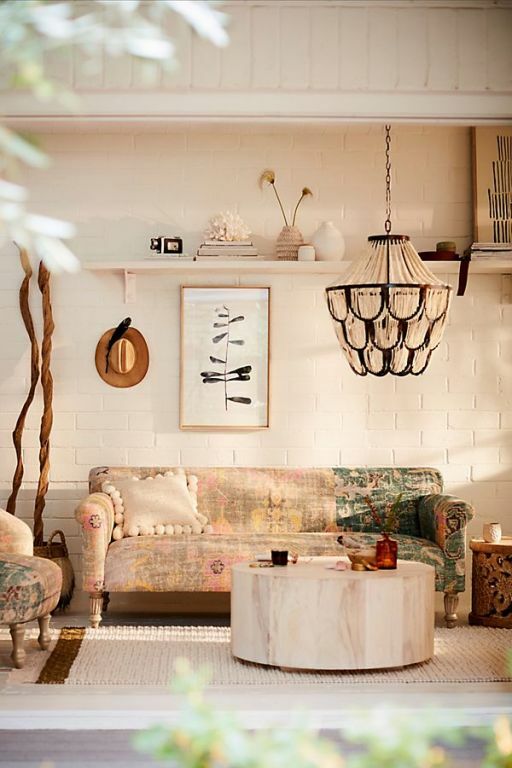 The subtle white polka dot walls are young and funky, but not overwhelming or distracting. 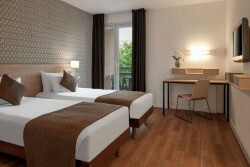 Bright throw pillows add pop to the space, and bunkbeds are perfect for brothers or a slumber party. 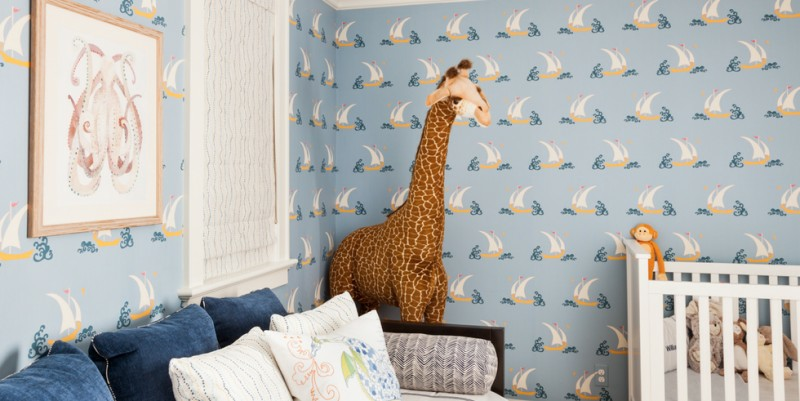 The youthful patterned wallpaper in this boy's room lends an energetic feel, while the soft muted blue creates a more calming environment. 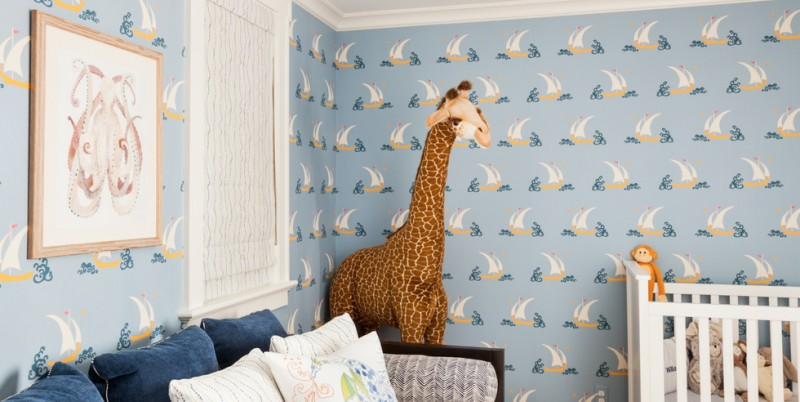 The plush giraffe is a perfect addition that can be removed once the child gets older. 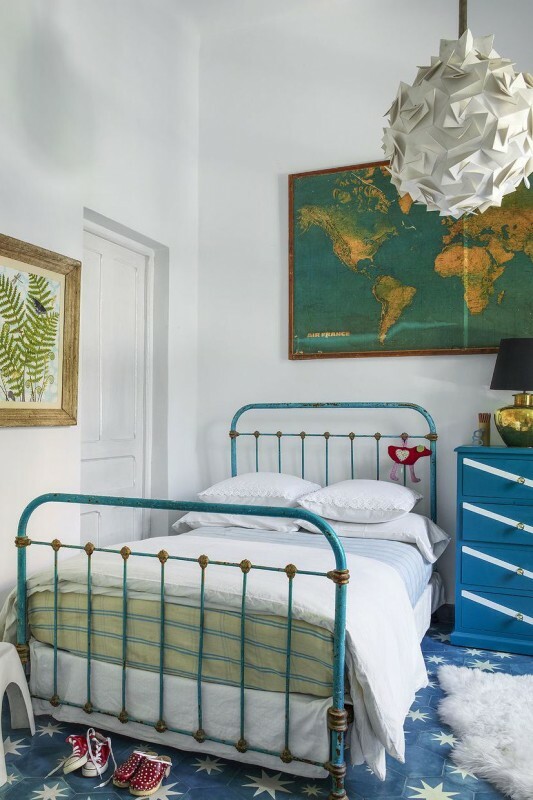 In the Paris apartment of designer Anne-Marie Midy, a custom-made bunk bed and colorful armoire decorate the bedroom her two young sons share. 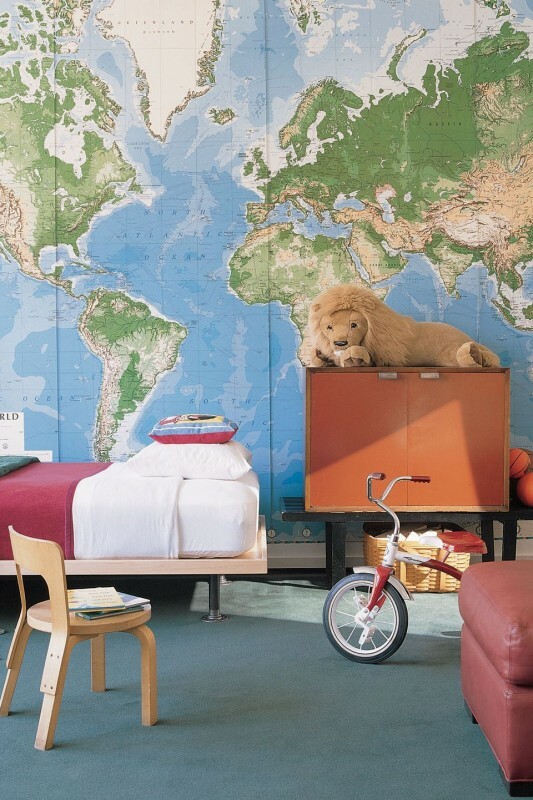 The boys' room in a Florida home is given a global perspective with the use of a world map as wallpaper. 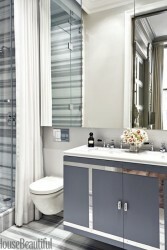 Designer Miles Redd used a crisp blue-and-white color scheme in the children's room of this Manhattan home. 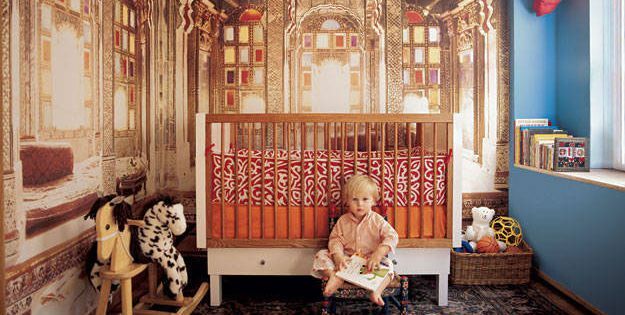 For his son's room, photographer Pieter Estersohn used one of his own images to add personality to the walls. 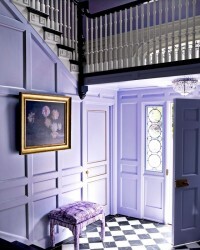 Style-setter Aerin Lauder decorated her son's East Hampton bedroom in electric shades of blue. In actress Julianne Moore's Manhattan loft, her son's room features a larger-than-life world map. 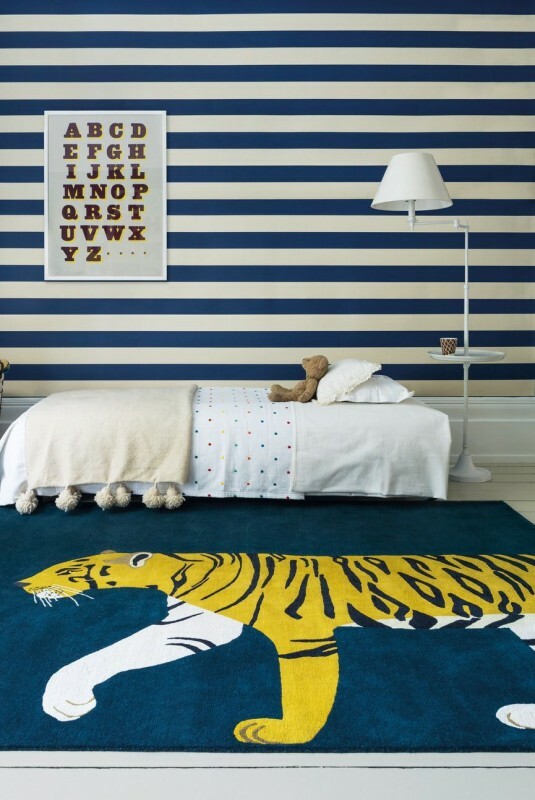 In this stylish yet kid-friendly Manhattan duplex, the son's bedroom features a bed by DucDuc, a womb chair by Knoll, and a pendant light by Kartell; the map decal is by Dezign With a Z, and the felt rug is by Patterson Flynn Martin. 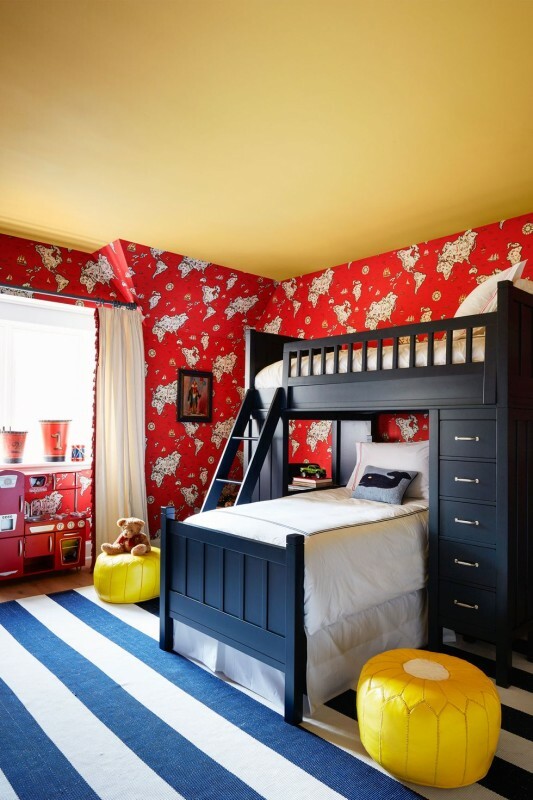 In a Pacific Palisades home that mixes a relaxed California lifestyle with Art Deco glamour, designer Alison Palevsky pulled off a boys' room that is colorful yet sophisticated, with striped bedding contrasting the colorful map carpet. 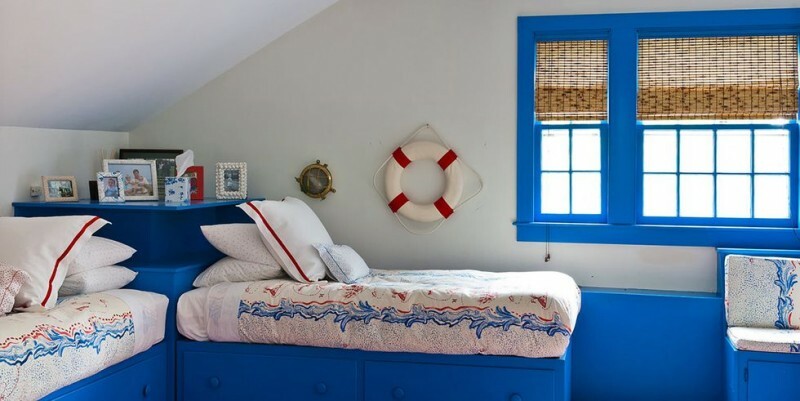 In the boys' bedroom of a colorful East Hampton home, bunk beds by Pottery Barn Kids are dressed in bedding by Sferra; the wallpaper is by Ralph Lauren Home, the rug is by Dash & Albert, and the ceiling is painted in Benjamin Moore's American Cheese. 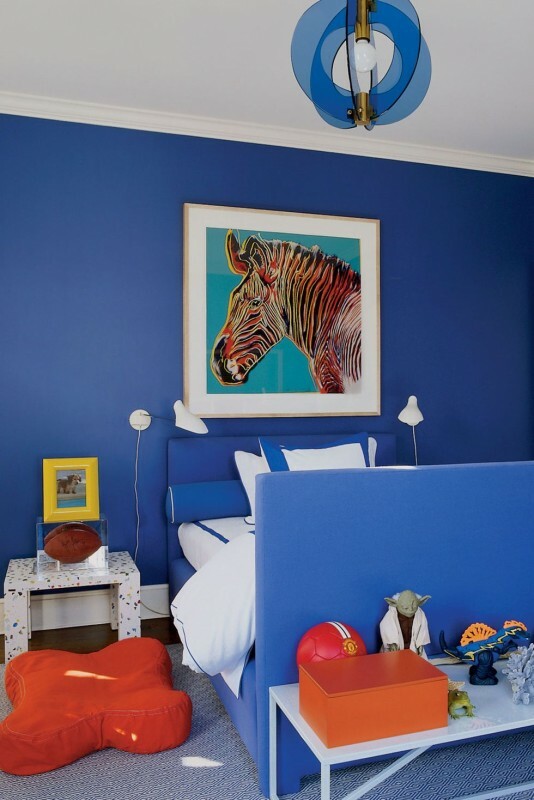 In this Manhattan home designed by Steven Gambrel, maps serve as colorful decor in the playful, vibrant boy's room. 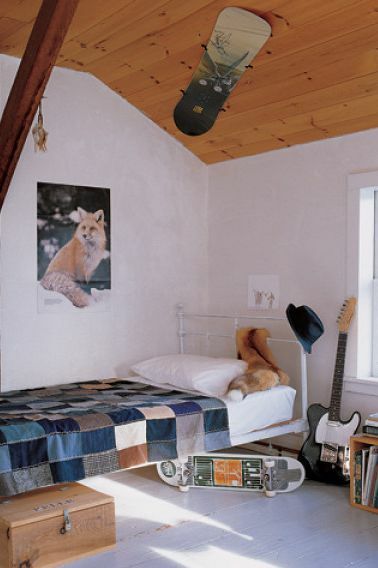 In photographer William Waldron's home, a young man's bedroom is filled with hints of what he loves, including a signed snowboard on the ceiling and a skateboard and guitar next to the bed. 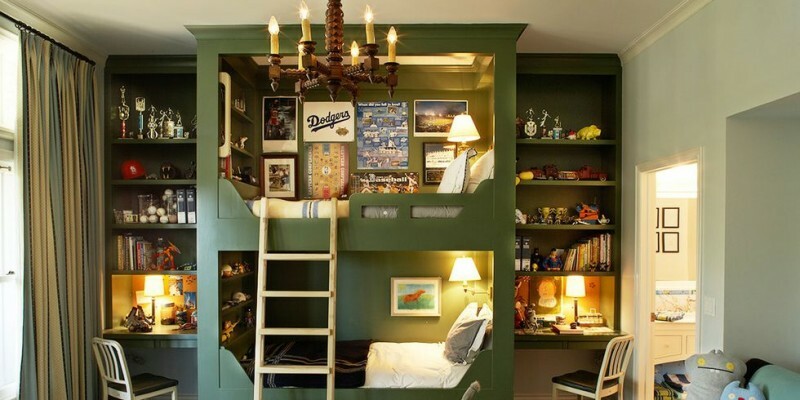 This room in a Silicon Valley family home features custom-made bunk beds and bedding by John Robshaw. 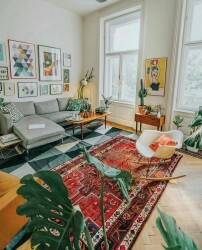 The pillows are by Jonathan Adler, the shag rug is by NuLoom, and the flooring is walnut. In beauty mogul Sonia Kashuk's home, things are kept soft underfoot with a double dose of flokati rugs next to the bed in the boy's room.